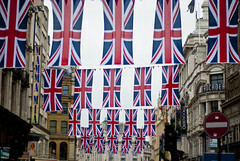 This week-end’s Diamond Jubilee celebrations in London (and, I presume, most of England) have been somewhat strange to observe from Scotland. Gauging from the photos I’ve seen and the comments I’ve read on Twitter, London has been drowning in excessive bunting, and companies have been trying to put the Union Jack on as many items as possible, even toilet paper (which in earlier times would surely have been seen as an act of lèse majesté). However, Scotland has been remarkably free of bunting, street parties and British flags, apart from some events organised by the Orange Order in Glasgow (thanks, Labour). It was probably not what the monarchists intended, but the feeling I’m left with is simply that England is a very different country from Scotland.